With just a day to go for the grand release, the ‘Puli’ fever has already started gripping everywhere. The stage is set for the release of Vijay's "Puli", which will thrill the audience from 1 October. The hype around "Puli" has reached sky-high. The advance booking can be taken as a simple indication of the buzz around the movie as the tickets are selling like hotcakes. 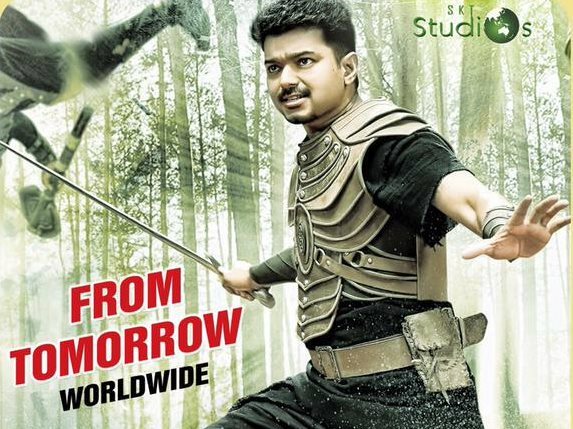 Leading trade tracker Sreedhar Pillai confirmed the buzz and posted, "Extraordinary advance booking 4 #Puli throughout TN. In @SPIcinemas sold out 4 opening weekend." The online booking was kick-started a week ahead of its release in several centres. According to latest reports, the tickets for the first weekend in some theatres in Chennai have been completely sold. Multiplexes have increased the screen count to meet the demand. Some exhibitors have completely dedicated all their screens for "Puli". Yet there seems to be a shortage of tickets. At single screens, it is believed that the price of the tickets will reach new heights in the black market. The trend is not just restricted to Tamil Nadu as there is quite a buzz in Karnataka and some foreign countries too. "Puli" will be simultaneously released in three languages - Tamil, Telugu and Hindi. "Puli" has some of the big names in the cast. Kannada superstar Kiccha Sudeep plays the role of the antagonist in the flick and yesteryear sensational actress Sridevi Kapoor has returned to Tamil after decades. Shruti Haasan and Hansika Motwani are playing the female lead roles in the movie. The film, directed by Chimbu Deven, belongs to the fantasy-adventure genre. PT Selvakumar and Shibu Thameens have jointly bankrolled the film, which is said to be made with a budget of Rs 118 crore.